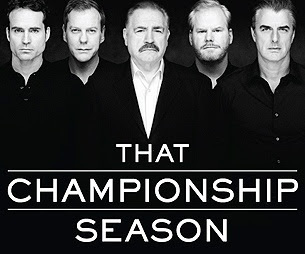 In this upcoming revival, Keifer Sutherland (making his Broadway debut), Chris Noth, Jason Patric (his dad Jason Miller wrote the Pulitzer winning drama) and Jim Gaffigan (another making his Broadway debut) star as former high school basketball players reuniting at the home of their coach played by Brian Cox, 20 years after taking home the championship trophy. The original movie starred some great actors like those listed on the dvd cover. The play was written by Jason Miller who lived much of his life in Scranton, Pennsylvania (about 25 minute drive from my home) which is also the home of the American version of The Office. 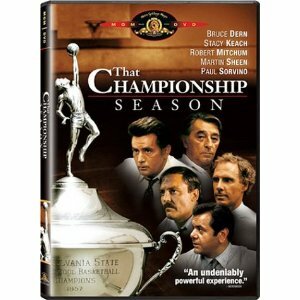 Mr. Miller won the Pulitzer Prize in 1973 for writing this great drama. The movie takes place at the coach's home which is in Scranton. I was really lucky to get a seat Row D Seat 7 .... I cannot wait for this show....will be a great way to ring in Spring and say good bye to Winter !! I can so understand your excitement!!! I would be the same....I love this kind of entertainment. Now, I must 'fess up....I'm jealous! Thanks for visiting with me and leaving such a kind comment. I too will follow you!! Oooh, have a great time at the show :) Probably amazing! And no, it is not a shop near my home. But I wish it was!!! Have a lovely day! Can't wait to read your review. What an amazing cast! How splendid! Thank you for providing the movie info - I am eager to see it. It's also to see Jason Patrick in the fray again - he looks wonderful! Needless to say, I was a fan back in the day and am glad to see he has not changed a smidge. I can't wait to hear your thoughts of the production. Here's to hoping for an early Spring! Lucky you! 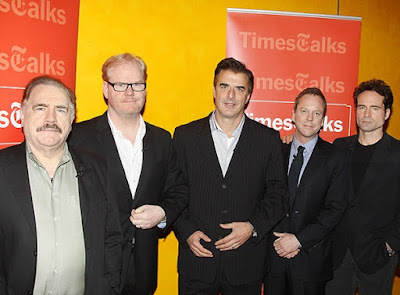 Getting to see Chris Noth up close in person! I had no idea he was on Broadway. I'm sure that will be a great play. Good cast all around. Thanks for dropping by my blog and for the sweet words. I'm sick of all this snow too. I haven't been to NYC for a while and had been planning a daytrip when all the snow started. *sigh* Hopefully I'll make it there soon! Lisa: Chris Noth is a big fan of broadway and I am sure this won't be his last show but I felt with this cast, nice way to see him finally. Wow! Mr. Big on Broadway with two of the original Lost Boys! (Keifer and Jason) You've got some great seats!